Start your RV adventures with a super deal on your dream RV from National RV Detroit! With our great prices and excellent customer service, we're regarded as one of the top RV dealers in Michigan - and the nation! 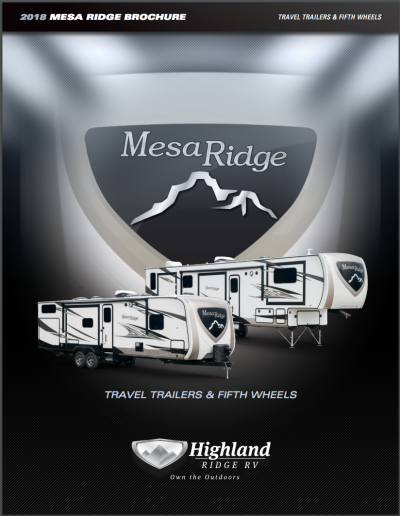 Our lot at 44700 N I 94 Service Dr Belleville Michigan 48111 is full of top quality, famous brand RV models, including this New 2019 Highland Ridge Mesa Ridge MF427BHS! For more information about this 5th Wheel or any other of our top brand models, call us at 734-439-3400 and talk to one of our friendly, knowledgeable RV experts! Save $1000s on your dream RV! It's easy to hit the road with this RV! It has a rugged GVWR of 16290 lbs! It hooks up fast, and the hitch weight of 2290 lbs. makes it easy to tow! The 12' 0" power patio awning means you'll enjoy outdoor comfort and protection from the moment you arrive! Stay warm on chilly nights and cool on humid days inside the reliable Mesa Ridge MF427BHS, thanks to its efficient 15000 BTU a/c unit and reliable 35000 BTU furnace! 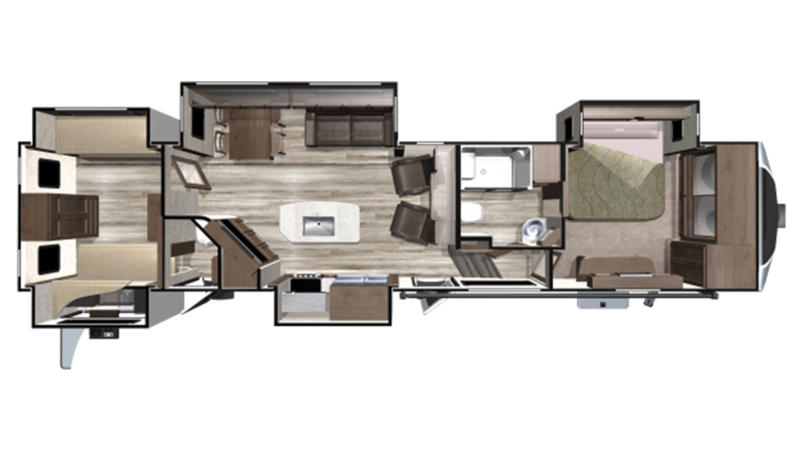 Feel free to stretch out and walk around freely in this 39' 6" long, 8' 4" wide, and 12' 11" high RV! Nothing tops off a great day of outdoor fun like a good night's sleep! That's what you'll enjoy every night in the handsome master bedroom with its regal Queen bed! So roomy and comfortable you'll drift off to dreamland before you know it! There are sleeping accommodations for up to 7 inside this RV! When mealtime arrives, you'll enjoy making delicious breakfasts, lunches, or dinners in the modern kitchen? It's a breeze on the 3 burner range cooktop! And the roomy 8.00 cu. ft. refrigerator can store all your fresh foods and cold drinks! Lots of hot water for clean up too, thanks to the 85 gallon freshwater tank and generous LP tank capacity of 60 lbs! One of the nicest accommodations in this RV is the bunkhouse! Family or friends can head in at the end of the day, cozy down in their own roomy bunk bed, and ease off to sleep in no time! You can keep the fun times going outside, even at meal times, thanks to the outdoor kitchen! Cook up whatever pleases your palate! The sunshine and fresh air will make everything taste great!